An historic apartment block situated in Killarney and built just after the Second World War is the winner of the coveted first prize in the 2012 Pam Golding Properties’ Outstanding Verge Competition. 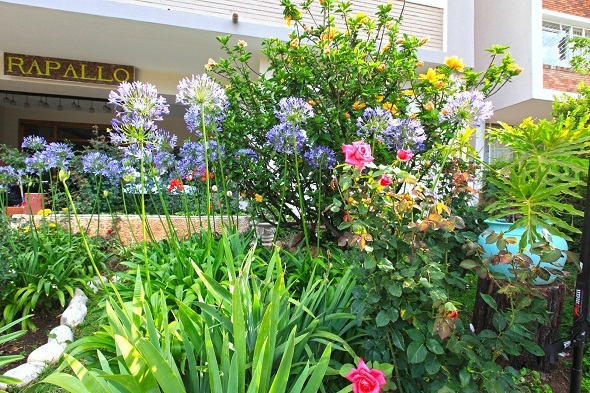 According to Pam Golding Properties (PGP) Hyde Park joint area manager, Jonathan Davies, the gardens of Rapallo were chosen as the winning entry in the popular competition because of its colourful splendour and unusual composition comprising roses, cacti and carefully crafted rock features. Rapallo, an historic apartment block situated in Killarney, Johannesburg, is the winner of the coveted first prize in the 2012 Pam Golding Properties’ Outstanding Verge Competition. According to Davies the PGP Outstanding Verge Competition is held every year in Johannesburg’s northern suburbs in order to encourage people to beautify their verges. He says that while verges create an important first impression on visitors and can even impact property prices within a neighbourhood, they are often not considered by homeowners. The competition seeks to change this whilst encouraging homeowners to take pride in their verges. Speaking on behalf of Rapallo, Celeste Mulholland said that the residents were immensely proud of their verge and the fact that they were the first ever apartment block to win the 2012 PGP Outstanding Verge Competition. The garden was developed by the 27-year old Sphiwe Matshen and the 30-year-old Jacob Lethole, a team who has worked at the complex for three and four-and-a-half years respectively. Sphiwe Matshen and Jacob Lethole lovingly created the verge with the aid of magazine pictures of colourful gardens sourced by Celeste as their inspiration. One of the most prominent features of the Rapallo garden is its roses, which are a particular passion of Matshen’s. According to Matshen roses require a great deal of patience, time and love. His personal favourite is the Double Delight, a beautiful hybrid tea rose. What makes this rose so special is the fact that the blooms are at first creamy white with just a slight red tinge on the outer petals. As the roses mature so too does the intensity of the red colouring. The most memorable feature of the Double Delight is the startling contrast between the layers of the bright red outer petals and the creamy white heart of the rose. The Rapallo apartment building, bordering on the Wilds, was built in the 1950s by Italian prisoners of war and features two original Baldinelli artworks in the entrance hall. One of the pieces comprises a colourful mosaic feature, which forms a backdrop to an unusual art deco stainless steel water feature while the other is a striking Picasso-styled oil painting. The winning prize is R20 000 and also includes a vegetable garden start-up kit for a charity of the winner’s choice. Celeste Mulholland thought the competition was an outstanding initiative as it really encourages homeowners to make an effort to improve their verges. PGP Hyde Park joint area manager Rupert Finnemore says that a number of different criteria are considered when judging the verges entered into the competition. The overall attractiveness of each verge is the starting point with the innovative use of plants and features such as rock formations, stone carvings, water features and other elements being considered as well. Some of the verges are indigenous while others have special themes. He notes that a special effort is made to judge each verge in its own right. For information please contact Pam Golding Properties Hyde Park Branch: 011 380 0000 or email jonathan.davies@pamgolding.co.za.